The Iowa Important Bird Areas program, a partnership between the Iowa Ornithologists' Union, Iowa Audubon, the Department of Natural Resources, and other public and private entities, uses citizen science to identify areas within the state which are 1) important to breeding birds; 2) important for migration staging; or 3) important wintering roosts. 43 criteria species - endangered, threatened, or of conservation concern - have been chosen as indicators of these areas. IOU members have been very active in providing observation data which in turn provides the information necessary to make an IBA designation for nominated sites. The first site, Hitchcock Nature Area in Pottawattamie County, was designated at the IOU fall meeting in 2003. In the photo Park Ranger Chad Greve is shown accepting the designation from the IBA Coordinator Ric Zarwell. Many of Iowa's IBAs are not only important for the conservation of birds but are also good areas to look for many species. Be sure to look at the details of these areas on the Iowa Audubon web site. Don't forget to enter your observations of the criteria species in the IOU Field Reports. The Cerulean Warbler is a species of global conservation concern. 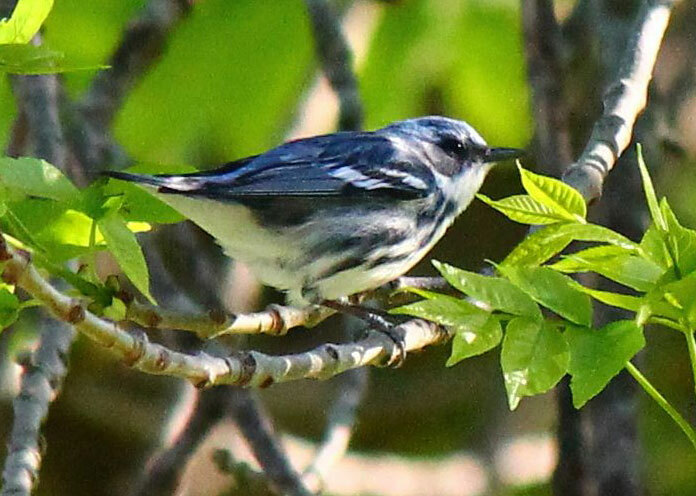 Although birders have known that the northeast corner of the state is the most reliable place to see these little blue marvels, it wasn't until more recently that Jon Stravers' research into breeding populations shed light on just how important this little corner of our state really is to their survival. As a result of his research, in part funded through IOU project grants, the Effigy Mounds - Yellow River Forest area has been designated an Audubon Globally Important Bird Area as well as an Iowa DNR Bird Conservation Area.